James Cameron gives his acclaimed action sequel the 3D treatment. The 3D revival kicked off roughly a decade ago with James Cameron as one of its most vocal and high profile supporters. Even those of us generally opposed to the format were forced to admit Cameron managed to get the most from it with 2009's Avatar, a film whose rampaging box office success meant 3D would stick around, for a while at least. At this point most Hollywood studios have pretty much given up on 3D, but Cameron refuses to walk away from it, applying the format to his upcoming Avatar sequels and now giving Terminator 2: Judgment Day a 3D makeover, as he did with Titanic five years ago. As 3D post-conversions go, T2 is pretty flawless, but it adds nothing to the experience. If Cameron insisted on tinkering with his film he would have been better served removing its one weak point, that cringe-worthy voiceover. That said, a chance to see one of the all time great action blockbusters on the big screen is not to be sniffed at. After the largely unnoticed sequel Piranha 2: Flying Killers, Cameron really announced himself as a cinematic force with the first Terminator movie, a low-budget marvel that skilfully blended the action, horror and sci-fi genres in a way few filmmakers had managed before then. After Aliens and The Abyss put him firmly in the Hollywood big league, he returned to the world of The Terminator for a 1991 sequel, this time with a budget almost 20 times larger than the original. The intervening years had seen Arnold Schwarzenegger become the world's biggest movie star, and with an eye on politics, the Austrian Oak wouldn't be too happy playing such an outright villain as the T-800. Cameron's fix was a stroke of genius - bring the T-800 back, but this time make him a hero, sent back in time by an adult John Connor to protect the 10-year-old John Connor (Edward Furlong) from an even greater threat, the T-1000 (Robert Patrick), a shapeshifting Terminator made of liquid metal. With Connor and the T-800 breaking Sarah Connor (Linda Hamilton) out of the psychiatric institute she's called home since being caught attempting to bomb a computer factory, the resulting narrative is essentially an extended chase, as our heroes attempt to evade the T-1000 while preventing the future robot apocalypse. T2's release of August 29th marks the 20th anniversary of the date on which the nuclear apocalypse occurs in the film, and with the threat of atomic annihilation back in the news, it's eerily timely. 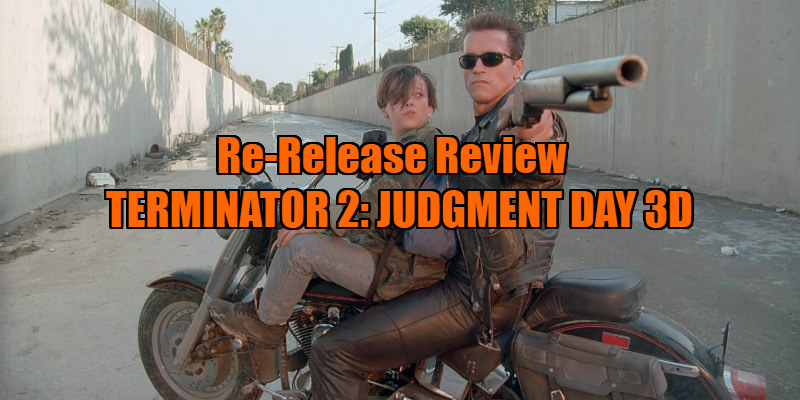 Several elements, mostly accidents of fate, now make T2 more relevant than on its original release. Sandwiched between the fall of the Berlin wall and the Rodney King trial, with Benetton commercials and Michael Jackson videos telling us we could all get along, 1991 was a time of naive optimism. The idea that armageddon would arrive via a nuclear strike seemed like pure fantasy, and made T2 feel several years out of date in this regard. Having a villain clad in an LAPD uniform played like a subversion of that outfit in '91; today it feels like an appropriation. Cameron's casting of an African-American actor (Joe Morton) in the role of Miles Dyson, the scientist whose work threatens to lead to the robo takeover, was most likely colourblind, but today it adds an extra resonance to two key scenes - one in which deranged survivalist Sarah Connor attempts to kill him in order to save the future of the human race, the other which sees him mowed down by a trigger happy SWAT team despite being unarmed. As an action spectacle, T2 is as effective as ever. Though CG had previously been used in the likes of Tron, Young Sherlock Holmes and Cameron's The Abyss, T2 was the first blockbuster to really put it at the forefront of its set-pieces. Hollywood adopted CG so immediately that a mere two years later Jurassic Park made T2's FX look quaint. Now that CG is the norm and we've been exposed to so many bad examples of how it should be used over the decades, the FX work of T2 holds up surprisingly well, largely thanks to how cleverly Cameron applies it in his storytelling. The key money shots involving the extravagant morphing of Patrick into everything from security guards to floor tiling are still powerful. Of course, T2 is much more than an FX reel, with many of its action sequences relying on old school practical stunts and skilfull choreography. Cameron gives a masterclass in how to stage and edit kinetic action here, and even when CG is pulling off tricks that defy physicality, his unshowy work ensures you're always immersed in the action and never distracted by the filmmaking. Something I really noted on this big screen outing was just how quiet this film is compared to modern blockbusters. There's very little dialogue, and Brad Fiedel's score is kept to a low background murmur. By modern standards its practically a silent film. Too many action movies rely on loud bangs and overbearing scores to cover the lack of excitement on screen, but that's not something someone of Cameron's talents needs to resort to. With T2, every piece of action is up on the screen, the images and editing propelling the story at breakneck pace, 137 of the fastest minutes in cinema. How the Terminator franchise could use Cameron now. 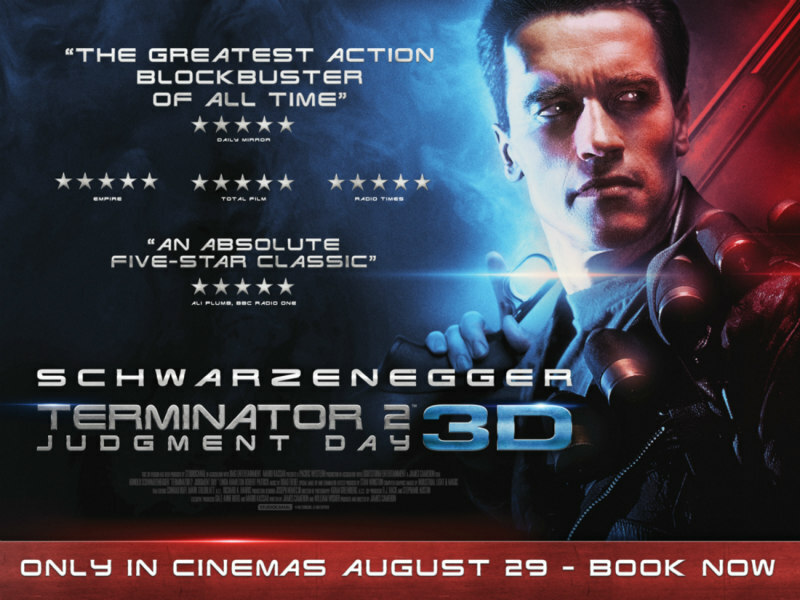 Terminator 2: Judgment Day 3D is in UK/ROI cinemas August 29th.